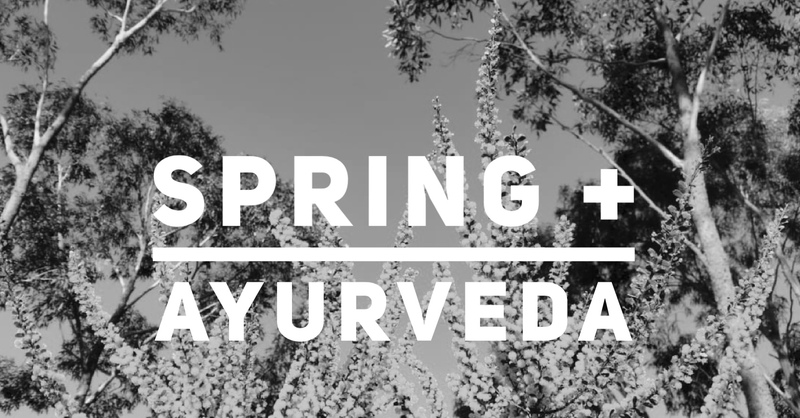 Spring in Melbourne is like the yogi’s lotus flower: something exquisite rising from a thick slurry of mud. It’s the season whose sun and blossoms siren-call you out of the house, yet whose bitter wind and slushy surfaces make you wish you’d chosen your gumboots, not your new white runners (now tide-marked with brown). Our response to spring can tell us a lot about what’s going on inside us (that we might not have even noticed). If we’re longing to play, feeling light and sparky and delighted, then we’re right in sync with the season, and well-balanced. But many of us are still weighted by our winter habits, longing for more time under the doona, perhaps accompanied by a large serving of chocolate self-saucing pudding. In yogi-speak, we might be experiencing excess ‘kapha’. Firstly, try and wean yourself off any heavy foods you’re craving. Hot chips are not your friend right now, and neither, sadly, is peanut butter or ice cream. Peanut butter flavoured ice cream is definitely a no-go (sob). Instead, make soups and stews with lots of fresh veggies, especially leafy greens, and steer yourself towards warming spices like cinnamon, ginger, and pepper. Beans and lentils offer protein and, when pre-soaked and well cooked, are easy to digest (try My Darling Lemon Thyme’s recipe for baked beans here or a rich ratatouille here). The sharp flavour of arugula or rocket is also a powerful kapha counterbalance, so don’t forget about the salad. It’s best to eat your biggest meal at lunchtime, when the body’s digestive fires or ‘agni’ are at their most powerful. Sipping chamomile tea can also help send any lovely spring sniffles and slime on their merry way. Secondly, see if you can coax yourself to yoga, or just outside for a walk, even when (especially when) you don’t feel like it. Excess kapha can be responsible for you hitting snooze five times rather than getting up and at ‘em, but when it’s balanced, kapha looks like real power, energy and endurance. Now is actually the time to really challenge yourself in your practice, warming yourself inside and out. Keep your flows smooth and steady, and take yourself just a beat or two deeper into each pose, challenging those strong muscle groups of the legs and the glutes especially. While sinking deeper into Goddess Pose and Utkatasana, holding Malasana, or feeling every fibre alive and strong as you hold the Warriors, see if you can challenge yourself to keep your heart open, arms light and lifted, and shoulders relaxed and soft. This creates space for newness, for movement, for strength. And generating tapas, or inner heat through these strong poses, will help you shake off the lassitude of winter, tap into your natural energy and focus, and embrace that irresistible promise of newness and beginning that spring offers, year after year. Thirdly ­– and this can be challenging if you’re afflicted with the aforementioned seasonal snots, in which case, keep tissues handy! – see if you can keep your breathing as smooth and deep as possible. Allow the belly to rise and fill as you inhale, and draw it to your spine as you exhale, spring cleaning your lungs and diaphragm. Ujjayi pranayama is balancing for all yogis, and is easy (many would say non-negotiable) to integrate into your practice. Warming, energising breaths like bhastrika and kapalbhati are also fun to play with and can have powerful results – you might come across these in class, the best place to be guided through new pranayamas. Pranayama is way more than an accessory to your practice: rather, it does the extraordinary work of sending our prana, or energy, or life force, or you-ness, or whatever you like to call it, flowing freely around the body’s channels. It can help us come unstuck in the best possible way, leading us towards the exact direction we need to go, helping us to see clearly, and simply making it easier to be the person we want to be. And as a last suggestion (perhaps more yogic than Ayurvedic): see if spring can enable you to give yourself the sweet gift of simply noticing. Notice the nuances of your mind and body with the same tender appreciation you have for the tenacious bulbs coming up, for the shocking yellow of the new wattle, for the wobbly little lambs in the paddock. Let this spring be the one in which you finally feel that you are here, arrived in your perfect place at your perfect time, exactly as you are meant to be. Balanced and whole. The season in which you are fully alive to the world around you, and the world within. They’re one and the same.